Did you know that even in our permanent collection galleries, art is consistently rotated in and out? So if you think you’ve seen all there is to see because you visited the museum on a fourth-grade field trip, boy are you in for a surprise. Through Feb. 19, there is some Seussian rumpus going on in the gallery of 17th-century European art. Stop at the glass case to catch this fantastic composition by Jean-Baptiste Pillement. Don’t you think there’s an element of “And to think that I saw it on Mulberry Street” going on? Pillement was born in Lyon, France, and at the age of 15 moved to Paris and an apprenticeship at the Gobelin tapestry factory. From there, he embarked on an international career as a painter and designer, honing his mastery of the landscape tradition in Spain and Portugal, exploiting the British taste for the genre in England, serving as a court painter to Maria Theresa and Francis I of Vienna, and decorating castles in Poland. Back in France in 1768, he worked for Marie Antoinette at her rustic getaway Le Petit Trianon, and he ended his long career designing silks and teaching at Napoleon I’s Academy. 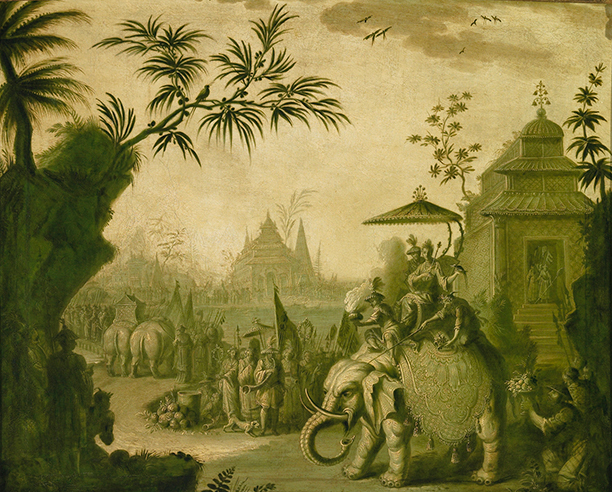 You can see his exposure to arts from around the world in this fanciful painting of an imaginary China that echoes Chinese porcelain.